Chewbacca has always been one of my family's favorite Star Wars characters. 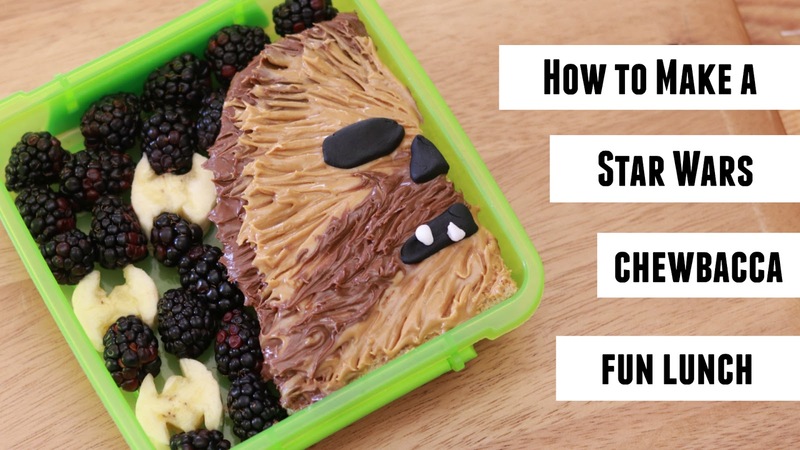 This was also the first Star Wars school lunch that I ever made my daughter, and it happens to be one of the most popular on my blog. After making it the first time, and making it again for Steve Harvey when I appeared on his show, I finally decided to recreate it for you with a video tutorial. Hopefully this can show you that it is actually really easy to make and perfect for a school lunch, or even for May the 4th Star Wars Day! I hope you watch the video below and have fun with it. Be sure to share with your Star Wars loving friends! Ingredients: 2 slices whole wheat bread, 1 serving low-fat creamy peanut butter, 1 serving Nutella hazelnut spread, 1 handful of blackberries, black and white fondant, 1 banana. 1. Cut a simple half “head” shape out of 2 slices of whole wheat bread as shown in video. Spread Nutella around the edges of his face on one slice to make the darker fur. Use peanut butter to create the lighter fur. Use Nutella to make the darker “mustache” area above the mouth. Place this slice on top of the blank slice. 2. Take a toothpick and blend the edges of light and dark together while also making lines to create a look of fur as shown in the video. This doesn’t have to be exact, because his fur is messy anyway! 3. Use black and white fondant to create the eyes, nose, and mouth as shown in the video. 4. Cut 3 slices from the banana. Trim the round slices into the shape of a Tie-Fighter as shown in the video. Arrange the blackberries and banana Tie-Fighters around Chewbacca’s head until you are satisfied with the placement. You might have to trim the blackberries to fit in the space provided.